The app VSR iView is designed for iPhone and iPad, letting you present your 3D data models created with the Rhino + VSR product suite anywhere and anytime on your Apple mobile devices. And it is perfectly easy to do. Virtual models can be viewed and moved, evaluated and analyzed, or used as a virtual element in an augmented-reality scene. 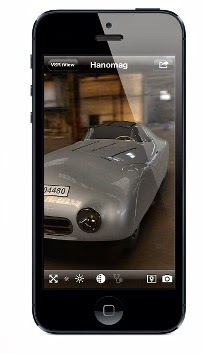 You can simply receive your model via an email or web download on your iPhone or iPad, by direct export out of Rhino (requires the free VSR WebGL toolbar), or even by synchronizing your files with iTunes. Besides viewing your 3D model, you can also display the analysis previously computed for your model with the Rhino + VSR product suite. In addition, VSR iView offers six different display modes, from realistic visualization to artistic effects.